This weekend my family is going backpacking. It’s the first time all four of us, my husband, myself, and our two daughters, ages 7 and 4, will go on an overnight backpacking trip together. My husband, Eric, compiled a detailed list of the things I’d need to bring (he is taking care of the girls’ packs. Rad guy, right?). On that list was a bandana. It’s been awhile since I had a bandana but I remember how useful they were when I used to go backpacking. 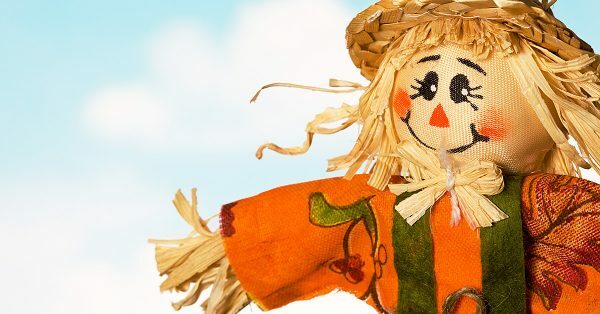 They can be used as sweat catchers, scarves, headbands, face masks, pot holders, to keep the sun off your face or neck, and even to tie a tourniquet. Honestly, their uses are endless. I just didn’t have one and darned if I was going to buy a bandana off of Amazon when I have a wall full of fabric bins and a sewing machine. 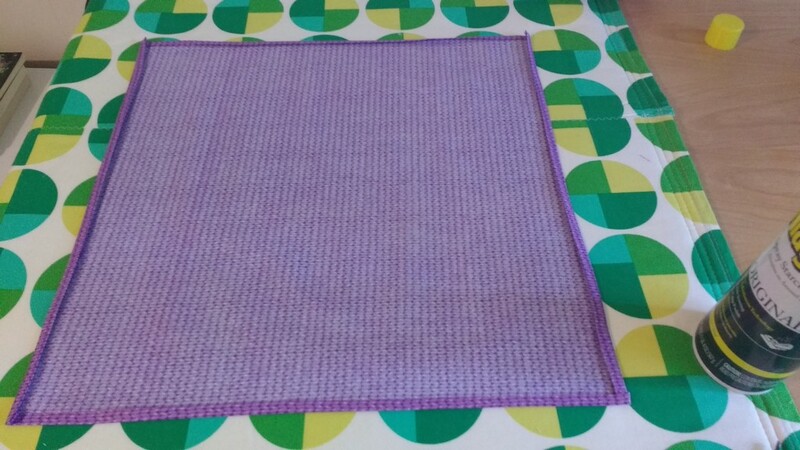 I grabbed a ½ yard of fabric which was a little over 18″ tall. If you have a bigger neck than me (that’s me in the photos) or want a larger bandana, grab 3/4 of a yard of fabric. I cut out an 18″ x 18″ square. Again, size up if you want a larger finished piece. Once you’ve cut the square, roll it up and test it out unhemmed. Does it fit around your neck? Around your head? If you want it big enough to create a possible tourniquet, around your thigh? Now is the most important part. Press and starch that sucker, especially around the unfinished edges. 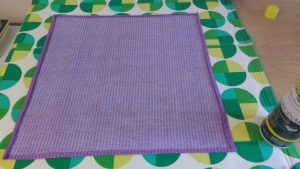 You can make your hems as large or as small as you like. 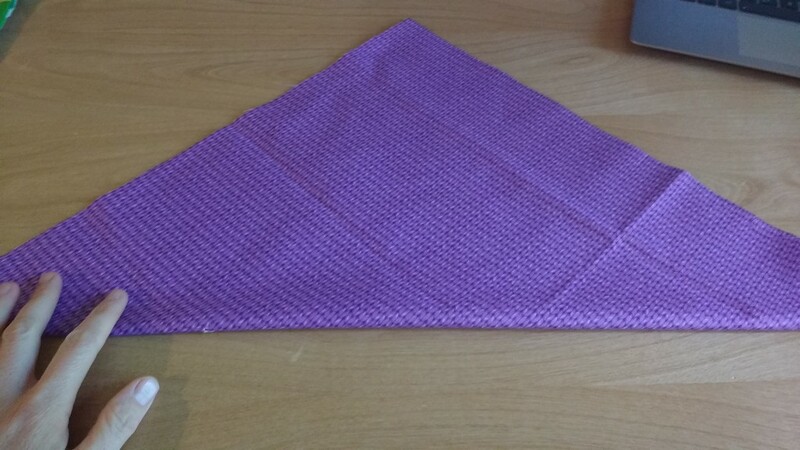 I like bandanas with TINY hems, so I rolled mine over even smaller than ¼”, pressing and starching all the way around. Then I doubled that over again, pressing and starching. Done! At this point, you could pin the pressed and started hems but I have a feeling that if you used enough starch they are going to stay put while you sew. Pick your thread. 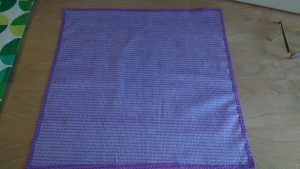 For this project I went with a purple that matched but once it was finished I wished I had gone with the lighter purple just for a fun contrast. You live and you learn. 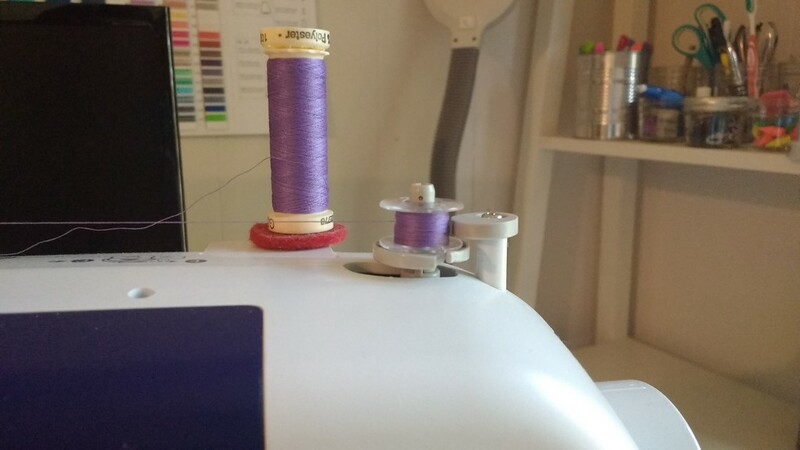 If you are going to use a decorative stitch, make sure you have enough thread in your bobbin. I tested out this decorative stitch on a separate piece of fabric first. I wanted a stitch that would look good and keep my hem nice and flat. 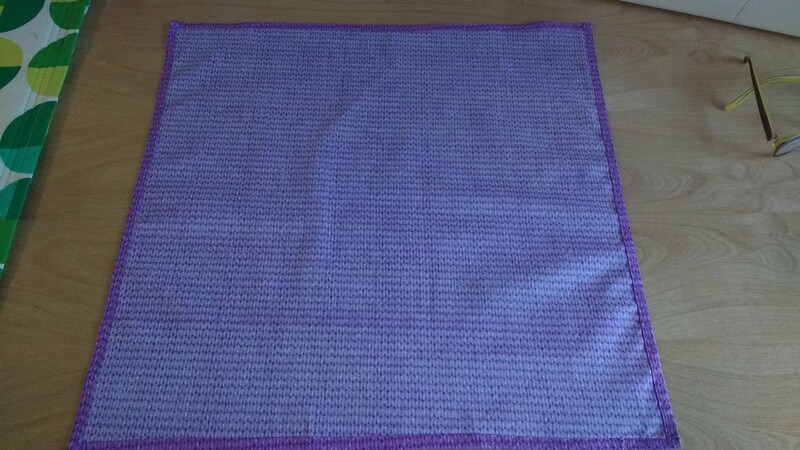 Start sewing a square. This is the easiest part after your prep work to get there. 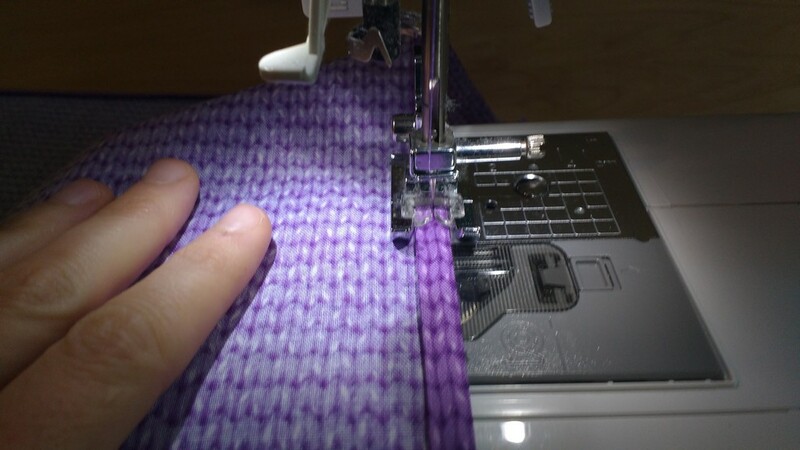 If you have a shallow hem, use a seam ripper to hold down the corners as you go. Look that beauty! And you didn’t spend $12 on Amazon for it. Try it on and enjoy. Happy camping! 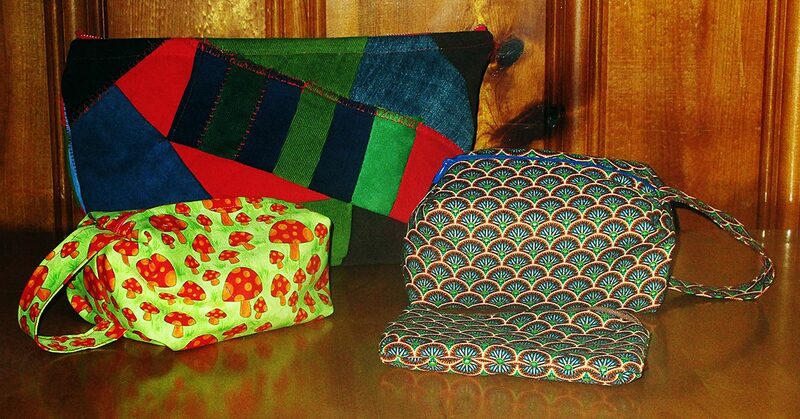 Sometimes it is hard to think of a great gift to sew for dad. It might seem like endless project options come to mind for most any other recipient, but gift ideas to sew for men don’t come quite as easy. 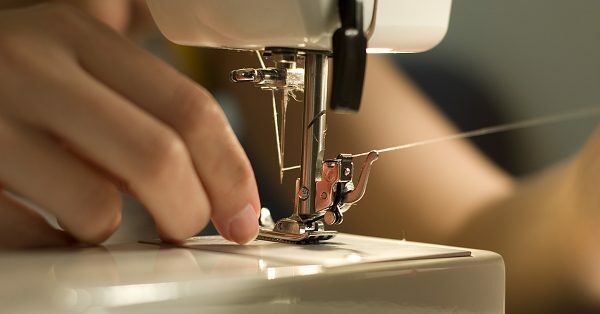 Between the holidays, his birthday, and Father’s Day, you need a few good gift ideas each year—and that’s if you only have one dad to sew for! To help solve this perennial problem, here’s a long resource list of ideas to sew for men, including your dad, your children’s dad, or any other dad you might love. I seem to list pillowcases in every gift idea post I write! That’s because they are easy to make in a hurry, everyone uses them, and none are as nice as those that you make. So they make a nice gift to sew for dad, too. My dear always loves a gift of a new pillowcase, especially for his jumbo XL long pillow. 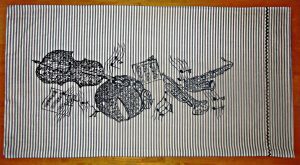 Last year, I made him one with Star Trek fabric, it is covered with line drawings of the Enterprise. I used a vintage yard I’ve been saving and some vintage trim, too, and made him a new one today. I think he’ll love this for his jumbo pillow. I love the extra bit the sparkly trim adds to this. Simplicity and other pattern makers make super easy to follow patterns for pajama pants. 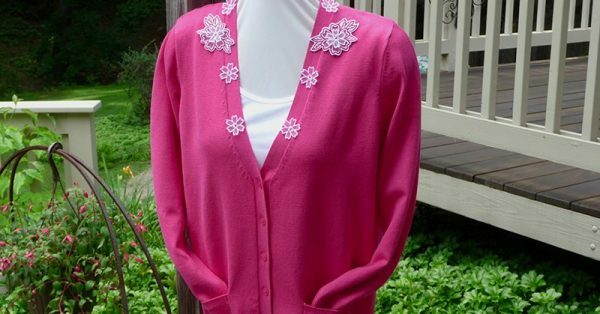 Or you can trace a favorite pair to make a pattern, or you can follow an online tutorial. Make them extra nice by adding pockets and drawstring waist. My dear prefers these cut quite loose and made from plaid flannel shirting; these look great on him, too. Make these from soft cotton; they are nice in flannel, or even knit. Use a serger to finish all sides. 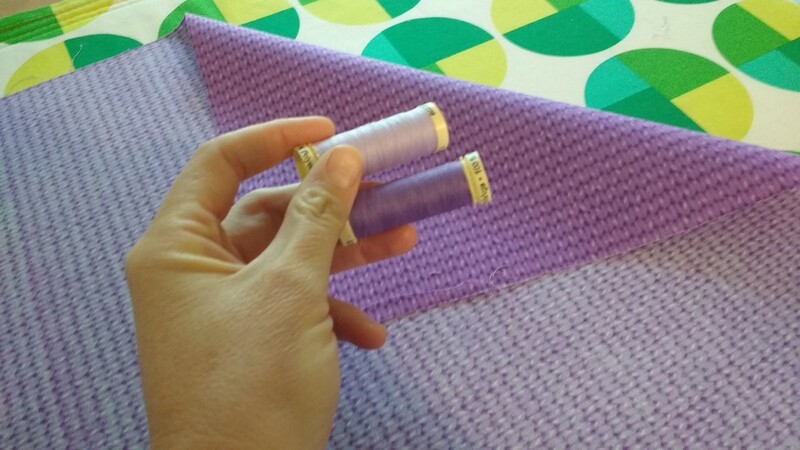 For knit fabrics, you don’t even have to hem them at all. To save a step, buy these pre-made and make them more fun with tie-dye or personalize them with embroidery. A quilt is a perfect gift to sew for dad. 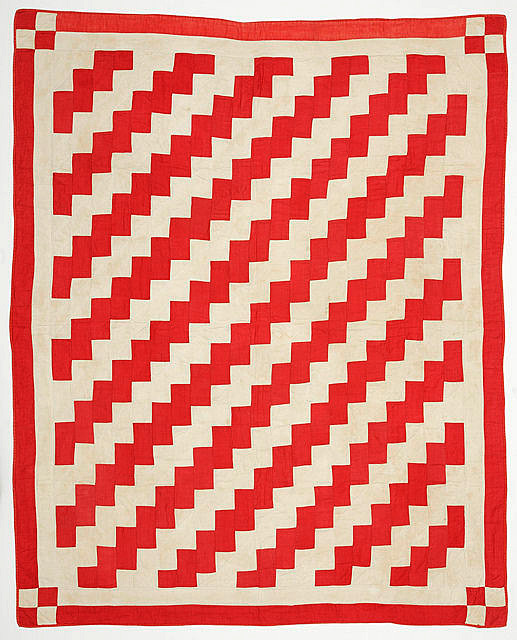 Make him a lap sized or larger quilt in his favorite colors if you know them. If not, you know he loves his college or pro team’s colors, or go with a muted and manly collection of scrap fabrics. 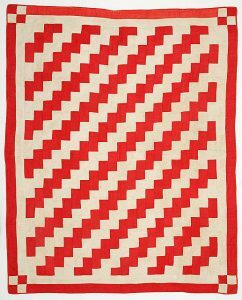 My favorite quilt I made for a man was a corduroy scrap quilt, with brightly colored squares alternating with khaki squares in a Streak of Lightning pattern. Choose a high quality, super soft cotton flannel for the quilt backing, and use cotton batting for maximum comfort quilts. Streak of Lightning quilt, Ashley Van Haeften, from Flickr. Sew an organizer pocket to go over the side of his chair and hold his remotes and things, or under his mattress to keep glasses and reading material safely at hand. Besides making a quilt, you can make his couch even cozier with custom cushions, perhaps one which includes pockets for his remote. Or make him a cuddly plush sofa blanket. Two layers of Cuddle Plush fabric make an ultra cozy sofa blanket. Use appliqué or a fun novelty fabric to make and personalize an apron just for him. 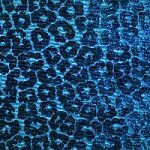 I like this reversible pattern from Michael Miller fabrics best. Make the gift even nicer by pairing it with an easy-to-make, matching chef’s hat (tocque is the proper name for these) or an oven mitt. Reversible, adjustable apron & chef hat. Help him around the house by sewing a full-coverage handyman apron or an easy pocketed waist apron for holding nails or a few tools. Everyone needs one. You can make it roll-up style, or with a zipper. Zip bags I made for guys yesterday. Make him a small and simple zippered pouch for holding his cufflinks and jewelry, sketching pencils, or other small items. For something a bit roomier, here is a tutorial for a boxy toiletries bag that will work well to sew for dad. You can sew an easy zip bag in 15 minutes, or less. These are simple and easy to make. If you prefer, make a hanging charging pouch. This one is really easy to make; scroll down to see a manly looking option. The iPlaid is a good choice for a guy, or you could make one from scrap jeans. 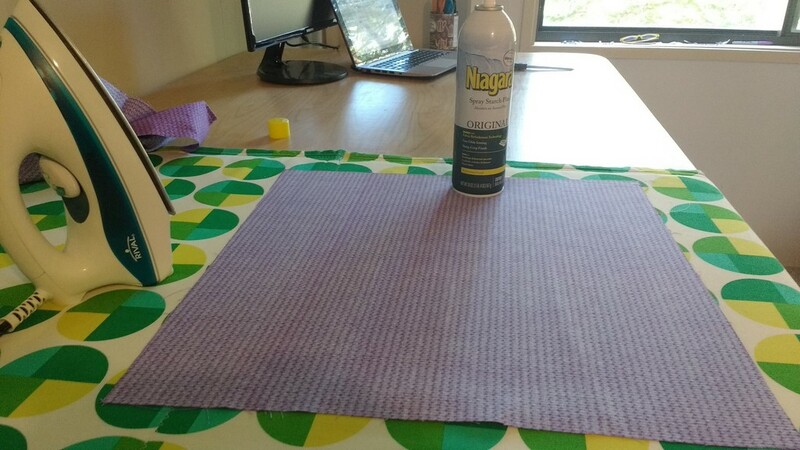 If you can get your hands on his laptop to take measurements, then you can make this easy laptop sleeve in an hour or less. For something with a strap, make him a messenger style bag to fit his laptop. He’d probably rather not carry a cutesy lunch sack, so here’s how to sew a reusable brown bag with waxed canvas. Make it bifold or trifold. Or make him a simple business card wallet. Make a tool roll or tool bag, a cord roll, a battery bandolier organizer, a monogrammed suede bag for his liquor bottle if he carries one to go, a shoe bag for travel. I’m making a patchwork quilted ukulele bag and a drumstick bag for my hubby this year. A soft padded guitar bag is a great idea, too. This fabric is perfect for lining his ukulele case. Here are free tutorials to sew these for a can, a bottle, or a coffee cup. Lanyard type key fobs make useful gifts. You can make them with webbing, leather, even recycled jean denim. Here is a neat tutorial that includes a way to make these with a zipper for a place to stash cash. Or make something else useful to hang hang on his keychain, like a chapstick cozy or earbud or iphone pouch. Plenty of dads still keep their music on CD. If yours does, you can sew him a place to hold them on his car visor. I made one with a patchwork dive flag and ocean blue fabrics for my diver dad. You can also use felt to make pocket pages and sew a folder or book for holding CDs. Dads love to wear babies, and babies love it when they do. For a new dad, make a sling type, mei-tai, or a toddler sized soft structured carrier in a manly color or fabric. 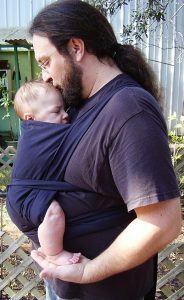 A mei-tai style baby carrier is super easy to sew and comfy for both dad & baby. 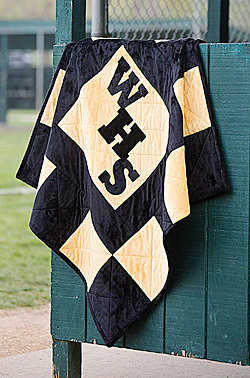 Stadium blanket, photo courtesy Fons & Porter. Buy a simple pattern, or use my 10-minute way to make shorts. You can make the bandana style shorts in that link for men using four bandanas instead of two. Just use two bandanas instead of one for each leg, and add side seams to sew these together. 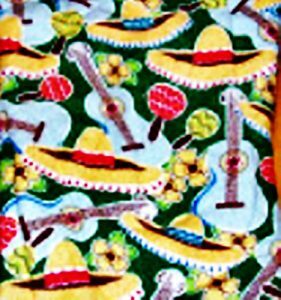 Add length at the rise with a matching or coordinating fabric, or cut a couple more bandanas in half and sew these at the top. Or choose a funky fabric and whip up some board shorts for him. Buy some silk and make him a stylish tie with a pocket square to match. Here are tutorials for a bow tie and how to add a secret wallet pocket to the back of any tie, too. Unless you live in the Southern Hemisphere, you probably won’t want to give dad a scarf for Father’s Day. But for winter holidays or birthdays, a scarf or cowl makes a great gift. I am sewing all my Father’s Day gifts this year. What about you? 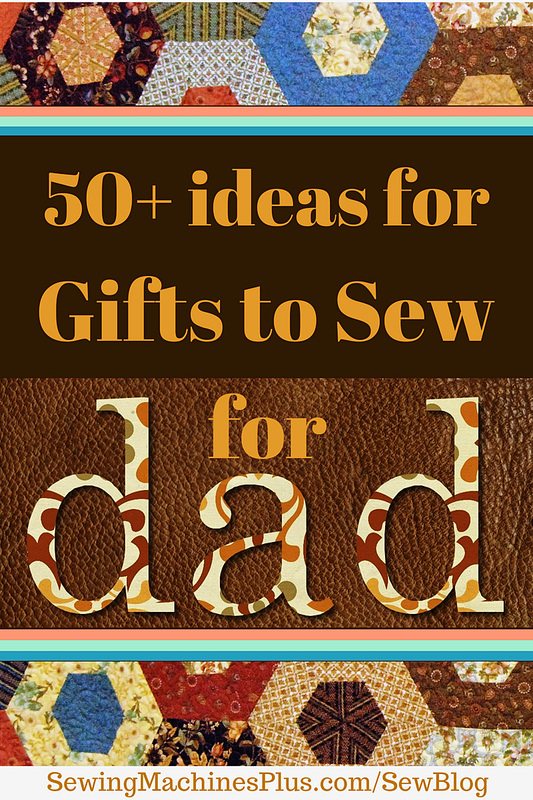 Which of these ideas will you sew for dad? 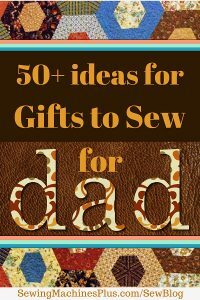 If you know any good gifts to sew for dad or men that aren’t on this list, please add them by commenting below. I don’t know about you, but if you ask me, this Winter can’t end soon enough. I’m dreaming of warm weather and beach trips, but the reality is that it is cold outside. On cold winter days, there is nothing cozier than fleece. 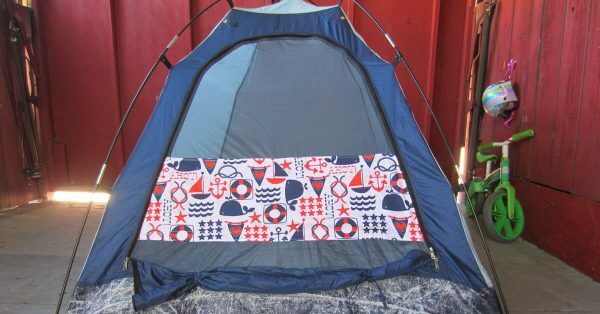 So I’ve scoured the net to round up some fun fleece projects for you to sew. Needles – Some folks prefer to use a universal point needle when working with fleece. If you choose this type of needle, be aware that fleece will dull these quickly and you will need to change needles often. I find a stretch or ball point needle works better and use these instead for sewing fleece projects. Regardless of needle type, I use use size 14 for fleece. 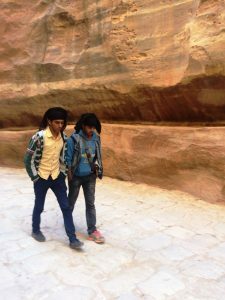 Foot selection – A roller foot or an even-feed foot (also known as a walking foot) will be most helpful. Reduce presser foot pressure to allow for the extra bulk. 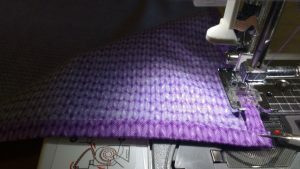 Stitching – I prefer to sew with a stretch stitch for fleece. 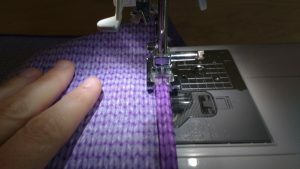 If your machine does not have a stretch stitch, you can use a narrow zig-zag stitch instead. 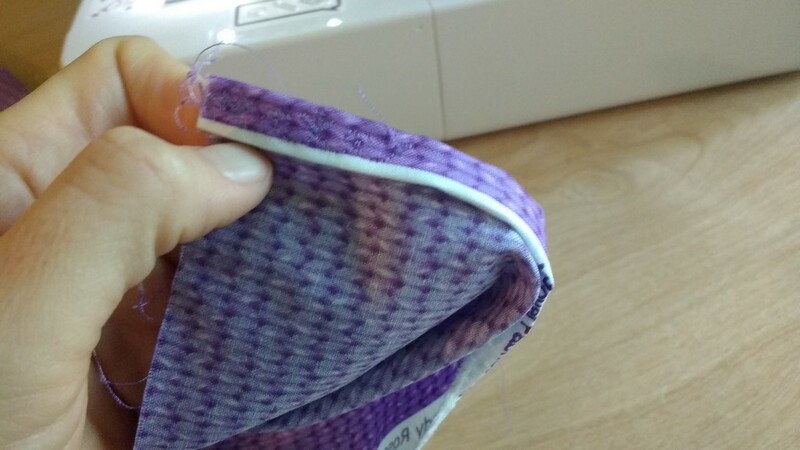 For straight stitching, use a slightly longer stitch length, about 3.5mm, to prevent skipping. Thread – Fleece is not only tough on needles; it can also be tough on thread. Don’t try sewing fleece projects with cotton or cotton/poly thread, as this may ravel or break. To prevent breakage, use 100% polyester thread. 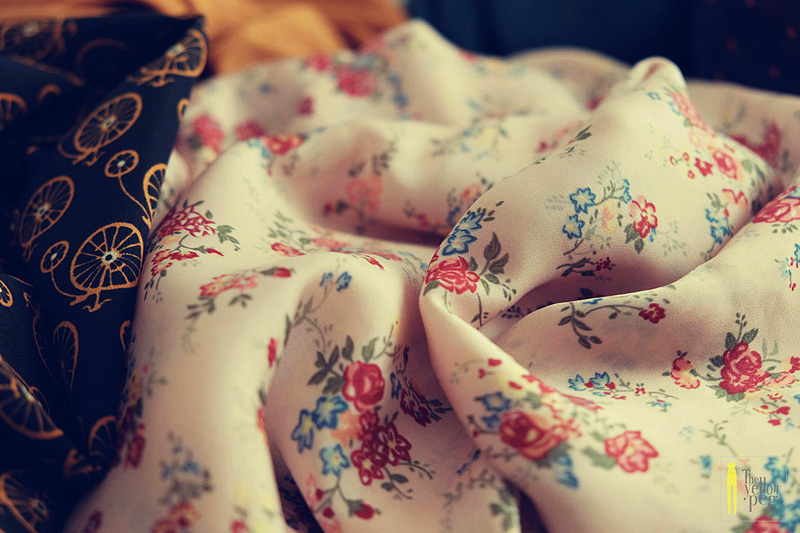 Don’t use an iron on fleece, as it has a very low melting point. To know which side is which, pull the selvedge taut; fleece will roll slightly on the wrong side. It is difficult to undo stitches from fleece, so work slowly and carefully to avoid mistakes. 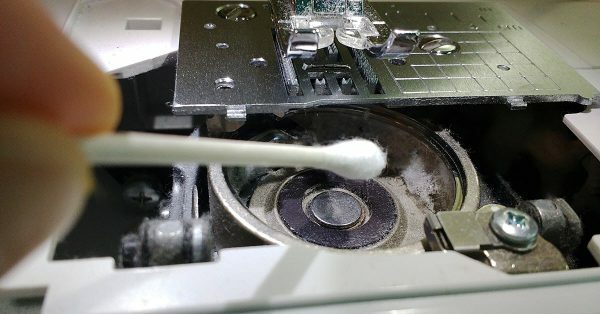 Clean your machine frequently when working with fleece, as it has a tendency to shed fibers. A U.S. Army survival manual from 1957 claimed we lose 40-45 percent of heat from our heads. There is some controversy about this figure, and this may be overestimated. 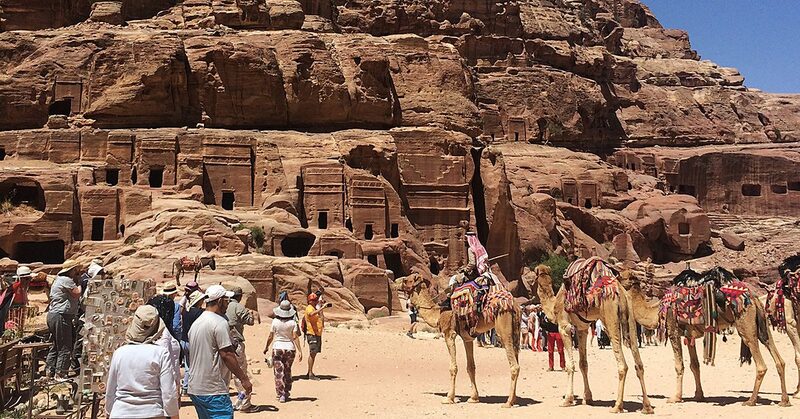 Regardless, you lose less heat from your head when it is covered! There are many cute ways to cover heads with fleece, here are just a few. Martha Stewart shows how to make several styles of fleece hats and includes a handy chart of head measurements for sizing help. 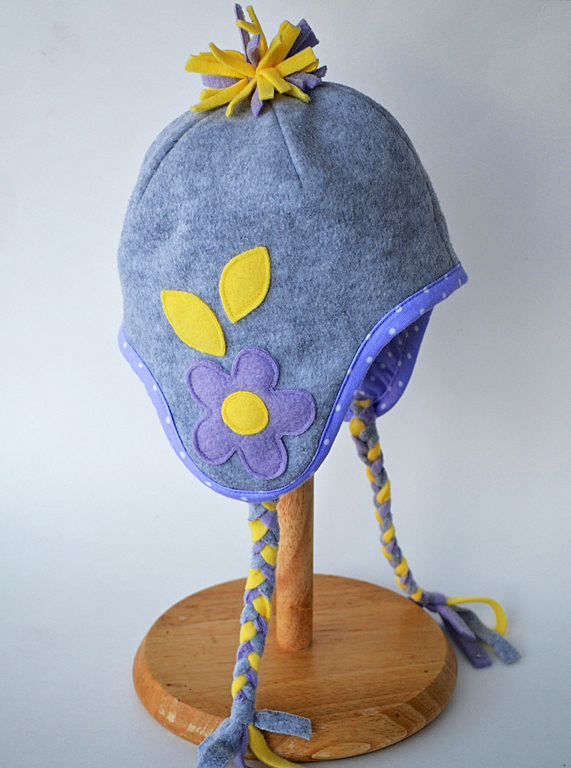 IKatBag features this tutorial for making fleece hats with ear flaps and cute embellishments. Here’s how to make a simple fleece headband, at Crazy Little Projects. Delia shows how to embellish a simple ear warmer headband with a huge fleece flower. 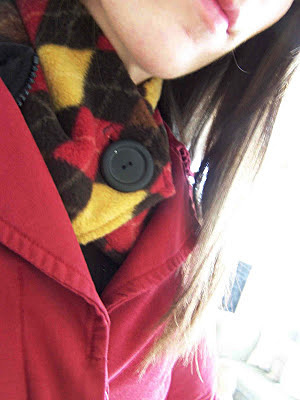 A fleece scarf can help keep you warm and fashionable, too. You can make one in mere minutes. 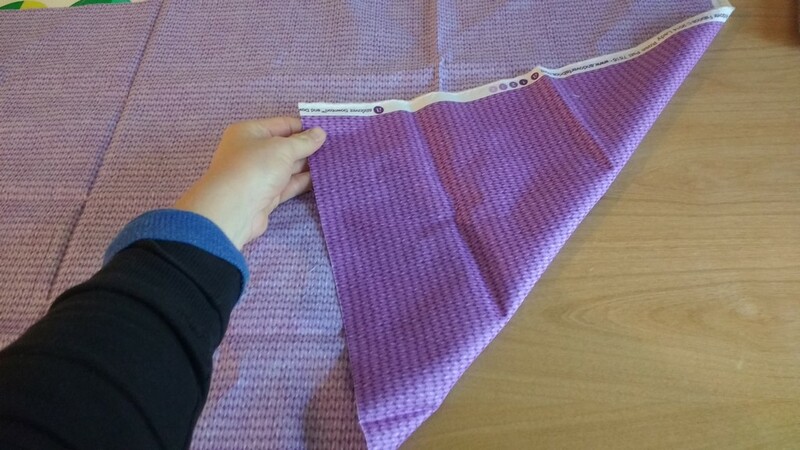 This post shows to make four different variations of a short scarflette. 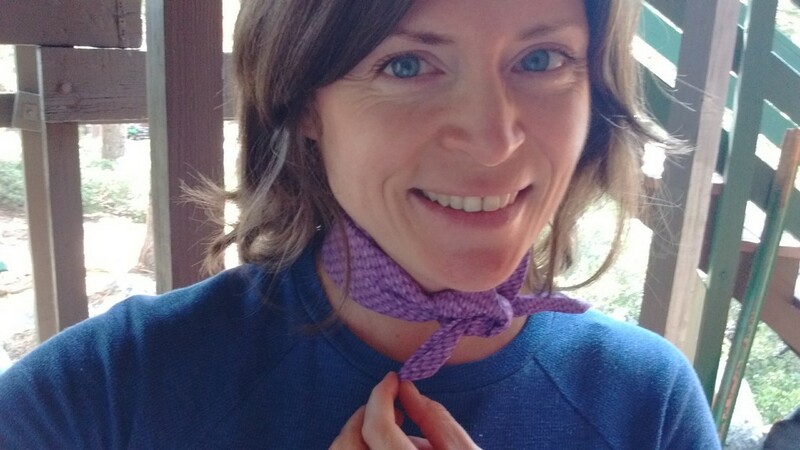 Here’s a tutorial for a three layered fringed scarf to keep you extra warm. For snake lovers, a scarf that looks like a snake is fun to make and to wear. Scarflette, courtesy of Leafy Treetop. Make It and Love It shows how to make a pattern for adjustable mittens to fit anyone. These fleece mittens are even easier to make and feature two layers for extra warmth. 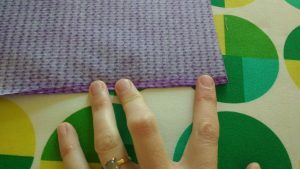 Here’s how to make fleece gloves with gussets. Ruffled fingerless gloves couldn’t be cuter. These only look complicated; they are actually easy to sew. This instructable shows how to make fleece socks from a blanket. If you’d rather not cut up a blanket, you could use fleece yardage instead. Here’s a video tutorial for making dainty, ladylike slippers from fleece. These fleece slippers will keep your ankles warm, too. Nothing is more comfy and cozy than fleece pajama pants. Simply Modern Mom shows to make them using your favorite pants as a pattern. The tutorial is for child’s pants, but you can use this method to make them in any size. If you don’t have a favorite pair to use for making your pattern, of course you can make fleece pajama pants using most any pajama pattern in your stash. 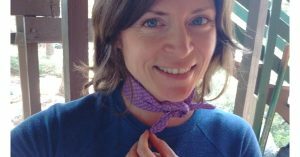 Here is a tutorial for making a lovely cowl-necked sweater from fleece that is as impressive as it is comfortable. The cowl neck is quite versatile. This can be worn in different ways, depending on the temperature outside. When it’s really cold and all you want to do is stay cozy indoors, you’ll appreciate this easy fleece caftan. This is even better than the popular snuggies, as it covers both your front and your back sides. Fleece outerwear is great because it’s warm, comfortable, and even repels water on wet and drizzly days. You can choose something easy and unstructured, such as a poncho or cape, or go with something more detailed, like a jacket or coat. This instructable shows how to make an easy poncho that’s also pretty. 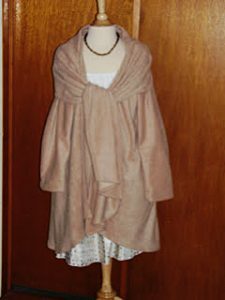 Here are several ways to make a beautiful long cape, with hood or without. This little girl’s cape includes a collar and dressier design details. 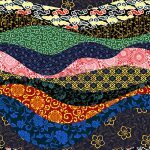 Craftsy has collected 6 different jacket patterns. This link has something for everyone. My personal favorite fleece coat is McCall’s pattern 5987. This coat includes a built-in scarf that can be styled several different ways. My personal favorite fleece coat is McCall’s pattern 5987. This coat includes a built-in scarf that can be styled several different ways. It has an attractive rounded hem that looks great with both skirts and pants. I have made this coat in camel, in charcoal, in navy, and one in red as a gift for my mother. I get lots of compliments on these coats every time I wear them. While they are fashionable outerwear, they are also so cozy that I wear them as an extra layer in the house all the time. Maybe I should make a fleece robe, because I don’t have any robe that feels near as nice over my nightgown as these coats do. Don’t be afraid of fleece. It is different than other fabrics, but nothing compares to the comfort fleece offers. 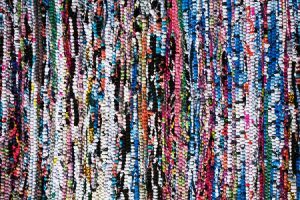 I also think of this fabric as being more environmentally friendly than many others, since it is often made from recycled plastic bottles. Sewing on fleece is easy if you know the tips and tricks shared here. 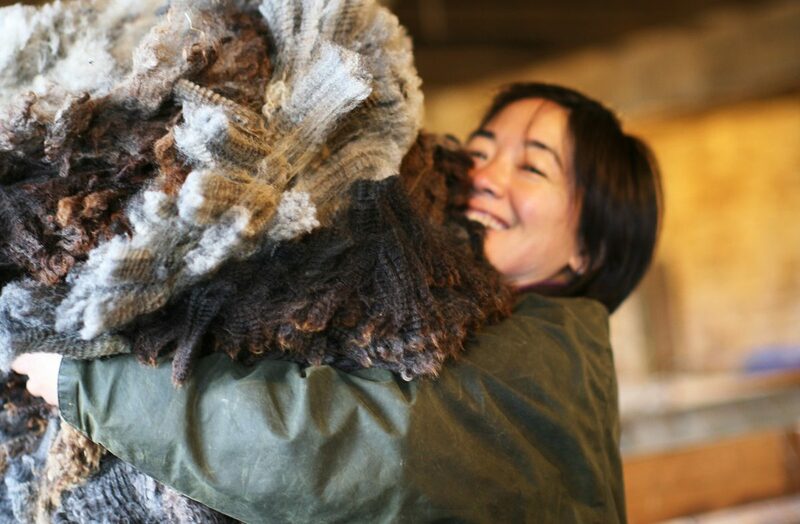 I hope you will try some of these fleece projects this season and enjoy them for many winters to come. Where has the time gone? This year is almost over, and has gone by so fast. The last week of the year is my time to regroup, reduce (stuff) and reorganize for the coming year. A fresh start, another chance, a new agenda and personal growth. What a great idea! Moving forward in positive movement to find ways I can inspire people to continue their love of sewing by finding interesting facts and ideas to share. I am EXCITED!! 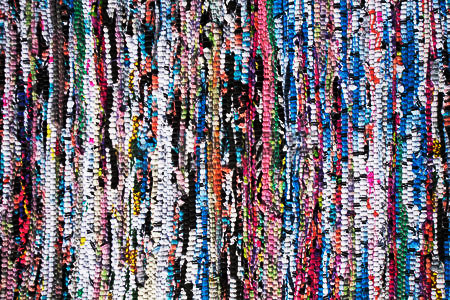 Take scraps and make a woven rag rug with a wonderful and colorful texture! 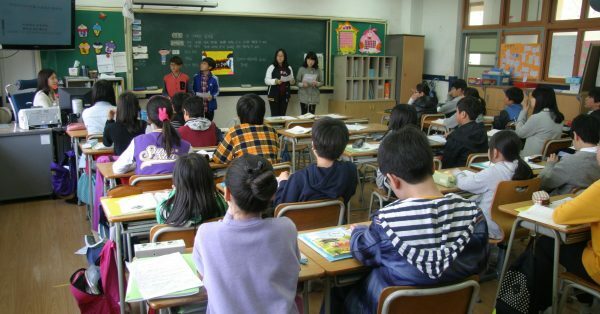 Careful planning is necessary to achieve your desired designs. Have fun choosing. 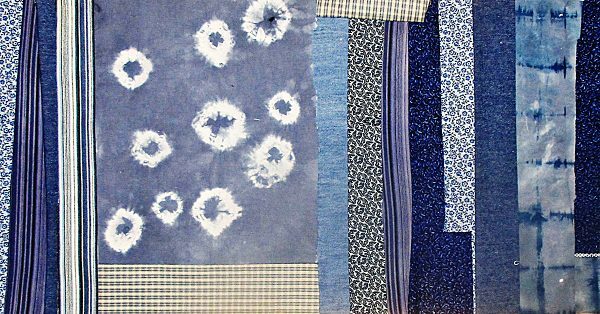 Research textiles and discover ways they are used in various applications in sewing and other art forms. 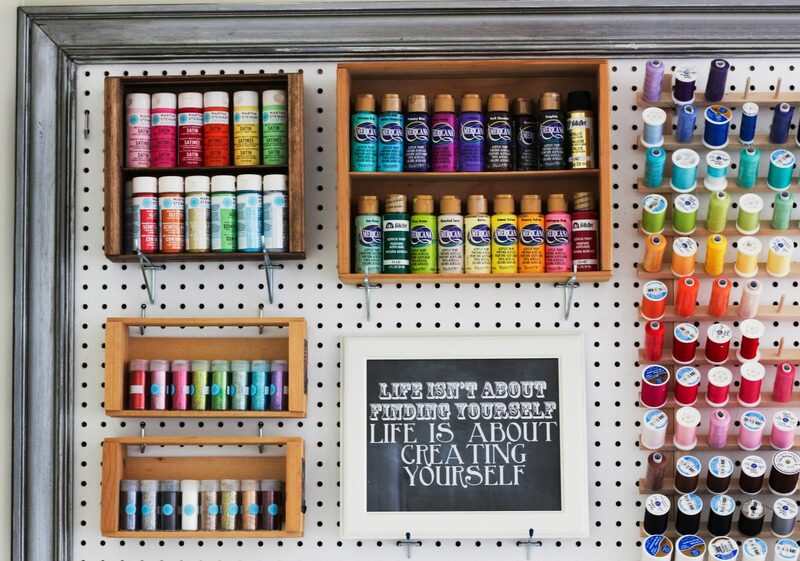 My favorite is mixed media using sewing, quilting, tie dying plain fabric and other ways to create 3D artwork. Make new curtains for my sewing studio using drapery fabric. Choosing one is the hardest task! 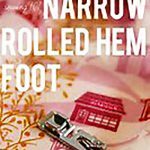 Experiment with different types of sewing feet like the Narrow Hem Foot to make professionally stitched napkins, table cloths and handmade scarves that will make people think you bought them from expensive designers! And some are very expensive! 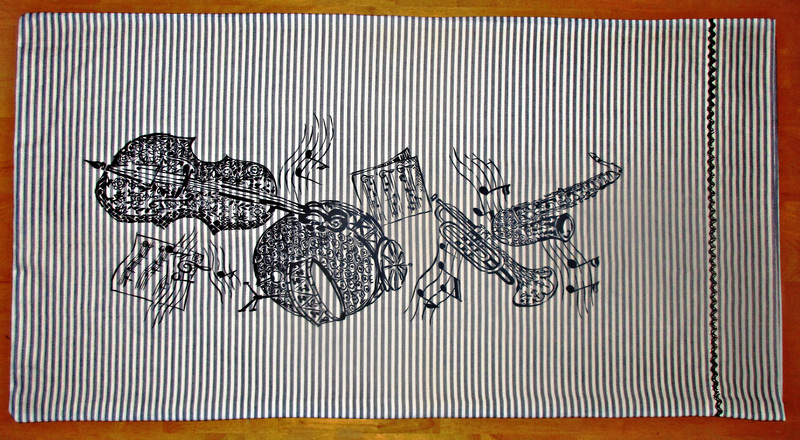 Use the wide variety of stitches on my machine to create interesting embroidery on quilt squares to piece together to create a scene or story. It is amazing how many things you can do. It may be a great time to upgrade your sewing machine to a designer model next year! Check this website for your choices! Sewingmachinesplus.com is the best place to buy. They offer many great choices!! 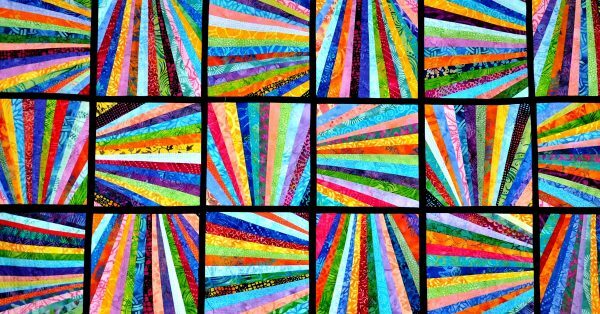 Reduce scraps, and pieces of fabric that can be made into a crazy quilt, or used for small projects for a children’s class project. (This is difficult for me because I always think of something I can make from them. 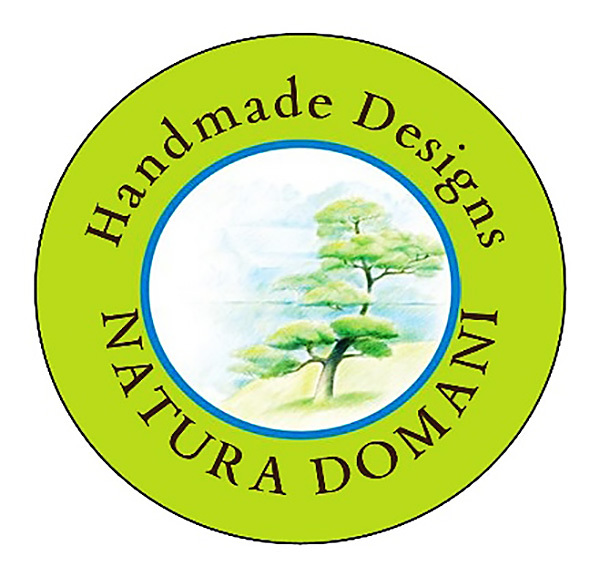 Design fresh ideas for NaturaDomani, my online Etsy Store. I hope to make a difference in the interest of organic fabrics, bamboo, hemp, and other eco-friendly textiles to save trees, water conservation and hazardous working conditions and to preserve beautiful things of Nature. Find outlets for charitable giving to pay forward Etsy sales and products. MOST IMPORTANT! Inspire my readers to use your creativity in sewing, and in life, to find happiness in yourself by learning new things and enjoying your achievements. 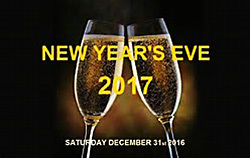 Also, to embrace love and the love of others so that 2017 will become one of your very BEST YEARS! 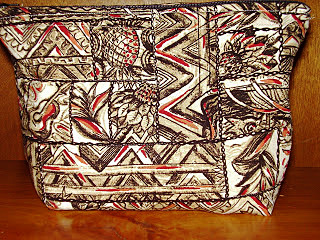 I find it fun to share my sewing experiences with you as I am building an online presence at Etsy.com. While I sew, I realize that as careful as I stitch, handmade things are never perfect. It’s the challenge and effort that counts. When shopping in a department store or online, you’re stuck with today’s fashions and color trends. If these suit your body style and personality, count yourself lucky! 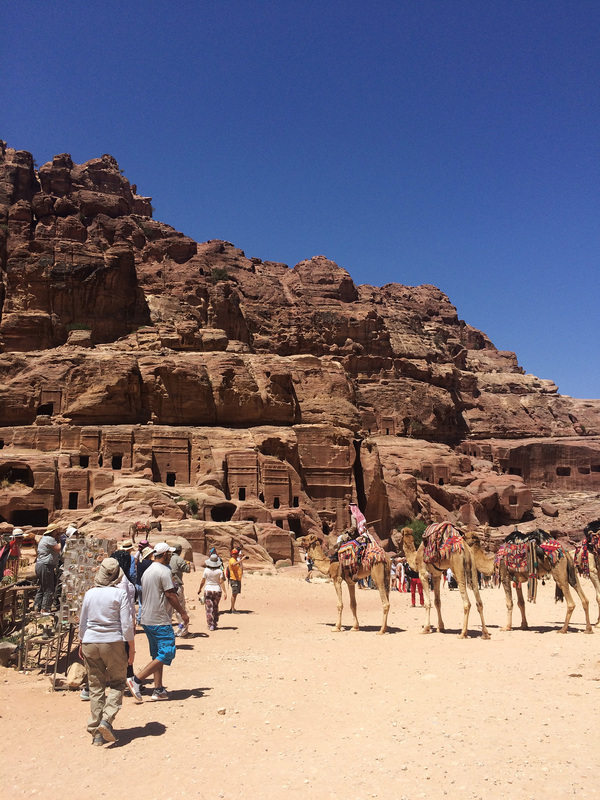 For the creative types among us, these can often feel confining. Sewing your own clothes and accessories is a great way to express yourself. 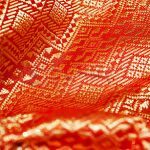 Whether you like cottons, silks, man-made blends or a unique combination there’s a dizzying array of colors, prints and patterns available online and at your nearest fabric shop. If you like bright, bold designs or something more earth-toned, there’s a multitude of choices available. If you’re one of those super talented folks who can create your own patterns, count yourself lucky. You’ve got an additional way to express yourself with your wardrobe. If you’re not one of those people, don’t worry about it – you can still express yourself with a pattern. 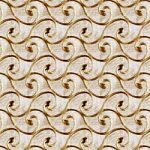 There are so many patterns available, ranging from simple to complex. Ok, you don’t really have to dance if you don’t want to, but making a scarf, or a number of them, in fabrics that compliment and enhance your existing clothes is and easy and fun way to express your personality with your wardrobe. 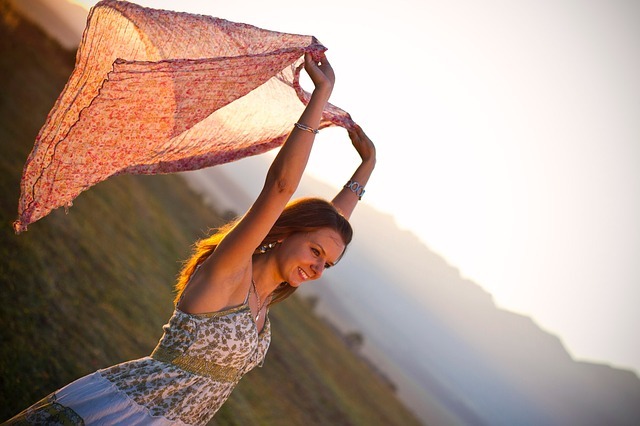 Scarves aren’t terribly expensive to make and they’re so much fun, you may actually want to dance and spin with them. If you’re not one for scarves, the same project can also be used to make a fabulous belt. If there’s a fabric or pattern that’s calling to you, go with it. You don’t have to be a fan of animal prints or bold colors to express your wild side. Polka dots, swirls, paisley and other patterns in a variety of muted hues give your wardrobe the personality and zing it’s been lacking. 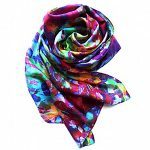 They work well as scarves or other accessory pieces, or larger projects such as shirts, skirts, dresses or pants. You can even bring your style into the office by using these fabrics to create a business suit or sport jacket. If there’s a fabric or pattern that’s calling to you, go with it. If it seems outside your normal style, all the better. Having one or two pieces that stand out from your usual wear means you can express your wild side when it needs to be freed without feeling pressured to show it off all the time. Days you want to stand out from the crowd, you’ll have a couple of unique pieces to show off. We all have a wild side and a more conservative side. Create pieces that allow you to express both sides – or anything in between! If you have more conservative days than wild days (or vice versa), create the appropriate number of pieces and accessories to give you the right balance for your style and your life. Share some of your favorite pieces – the ones that you feel express the real you.